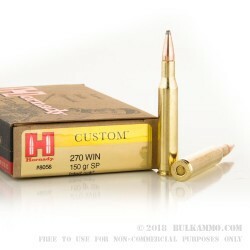 This 270 Win cartridge from Hornady’s Custom line of ammunition sports a 150 grain soft point InterLock projectile. 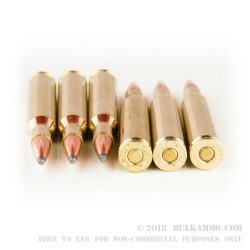 This bullet’s host of performance enhancing features includes a tapered jacket to precisely control expansion at practically all velocities; inner grooves that strategically weaken the upper section of the jacket to ensure consistent mushrooming; a one piece core that retains mass and energy for deep penetration; a cannelure for accurate and consistent crimping; and a raised and embedded proprietary InterLock ring to ensure that its jacket and core stay unseparated during penetration for optimal mass and energy. With all of these features working in conjunction, this is a bullet that will really deliver during those precious few days of hunting season. Every round of Hornady’s Custom ammunition is hand inspected for quality before shipping out, so you’re assured a perfect shot with every trigger pull. 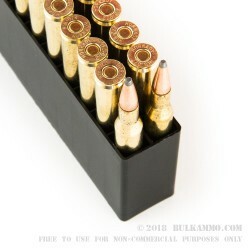 It’s handloaded accuracy in a factory load, complete with a reloadable Boxer primed brass casing.